Spectacular light shows: which get more and more impressive with the use of next-generation LEDs and lights. 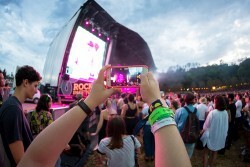 Mobile apps: These include maps, schedules and playlists of the bands performing. They’re perfect to help you discover new bands and highlight the ones you absolutely can’t miss. Apps are also a very smart way for festivals to stay in touch with their customers and send them info all year long for the next edition. For those interested, the guys at Green Copper make great festival apps. Cashless payments: In some festivals, you can even pay with an RFID chip that you can recharge wherever you are from your mobile. No cash means less risk of robbery, fewer mistakes, much faster payments (so shorter queues at the bars) and organizers even get real-time data to know when and where the bars are busy so they can better allocate their bartenders. Brilliant! Real-time info: For example on the wait-time to enter the festival, or affluence predictions from stats of the previous years. This would avoid massive crowds wanting to enter at the same time. (I had to wait 2 hours to Solidays the first day and missed a show I really wanted to see.) The same idea applies to toilets and buses after the event. This could live on Twitter, via the mobile app or simply, the festival website. Song names: Why not use the new big screens to share the names of the songs a band is playing? People can then easily pick them up and add them to their personal playlists. It’s also a great place to include an official website, socials links and even display fans’ tweets using a targeted hashtag. Set up Shazam so people can tag one of your live songs (only available during the concert) and later, when they have a proper internet connection, they get one song or the full concert available for download. You can also provide these in exchange for an email address or Facebook Like — a great way to convert new fans who just discovered you. Use Twitter for song requests, for instance: a minimum number of retweets guarantees the band plays its biggest hit. This is a great way to generate social activity and buzz during your show, and you can later direct message fans to offer them a meet & greet after the show (from they’ll of course share photos and retweets). Best festival experience ever, right? Go live with Periscope, Facebook or YouTube Live to broadcast the start if your show. Or go all the way and stream your whole show. Then, encourage your fans to watch on your profile of choice. Create a web-series around your summer tour! This can be a more evolved YouTube show or simply short films and photos on Instagram. Propose a Q&A to your fans after the show to get their thoughts and feedback, and share pictures and memories. Did they like the show? What was their favorite song? All this information can prove valuable. Adjust pricing: Take a page from airline companies and use Yield Management for festival ticketing. Many festivals are already proposing cheaper deals before the first performers are announced. Prices can then increase with the release of new headliners and programs. This is a great way to reward your early birds and generate early ticket sales. Create a sharing program: Create an app so people can share boots, raincoats, cars and more. While we’re at it, put together a video that reminds people of all the benefits of mud on their skin — weather is maybe the last thing digital can’t fix yet, and well, it just adds to the experience of the show!